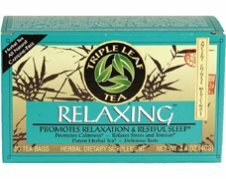 Triple Leaf Relaxing Tea is a highly potent blend of nervine herbs that helps promote healthy relaxation and restful sleep. This delicious caffeine-free herbal tea includes valerian, passionflower, skullcap, chamomile and catnip, powerful herbs with a long history of use to help promote calmness and help relax feelings of anxiety, stress and tension. These soothing herbs help support the body�s natural ability to unwind, relax and rejuvenate. A cup of this tea before bedtime helps promote a quick, peaceful and restful sleep, and waking up feeling relaxed, refreshed and alert. A relaxed state and a good night�s sleep help to brighten the mood and gain a new perspective on our daily lives. Besides contributing to a sense of well-being, relaxation and peaceful sleep help maintain a healthy body and mind. This special blend of herbs makes an effective and delicious tea that you can enjoy everyday. While these herbs are grown in the West, they are popular with people everywhere. HOT TEA: Pour 1 cup of boiling water over a tea bag. Let steep 10 minutes or longer. Squeeze the tea bag gently into the cup. Leave in the cup as drinking. ICED TEA: Pour 1 cup of boiling water over 2 tea bags. Let steep 10 minutes. Remove the tea bags, squeeze gently into the cup, then add ice. For stronger flavor and effect, steep longer, or use more tea bags. A tea bag can be re-used to extract more herbal benefits. For a delicious change, try it with honey, or your favorite sweetener. Triple Leaf Teas are made by a Chinese-American family owned business. The company combines ancient Chinese herbal formulas with the input of modern day Chinese herbalists trained in traditional healing herbalism. The result is the creation of these delicious healing teas to meet modern-day needs. 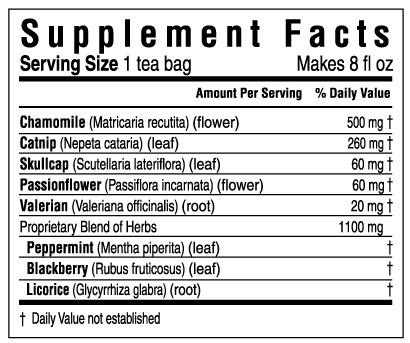 The herbs you find in their formulas are those used in China by Chinese herbalists. Some herbs you will recognize as renowned Chinese herbs; others are less well-known in the West but prized in the Orient. The use of authentic Chinese herbs and herbal formulas created by experienced, skilled Chinese herbalists assures you of benefiting from the vast herbal knowledge accumulated since Chinese medicine began in approximately 1500 B.C.